When August "Augie" Merback steps out on the field at Memorial Stadium -- white uniform on, silver mace in hand, knees kicking high -- the drum major for Indiana University's legendary Marching Hundred is thinking about only one thing: putting on a show. "Our purpose is to bring spirit to the crowd, cheer on the team as much as possible and entertain the fans," Merback said. "What I do isn't really complicated. I just try to throw the biggest, highest toss I can and to perform for the crowd. But they love it, and it is such a rush. It's just amazing. There is no other way to explain it." August Merback studies musical education at the Jacobs School of Music. Photo by IU Communications. Merback grew up in Bloomington, with early aspirations of working with animals. Always a showman, Merback never had any real interest in music until he joined Bloomington High School North's Color Guard his freshman year. That led to an encounter with band director Janis Stockhouse his junior year. As she tends to do with most students, Stockhouse encouraged Merback to pick up an instrument. 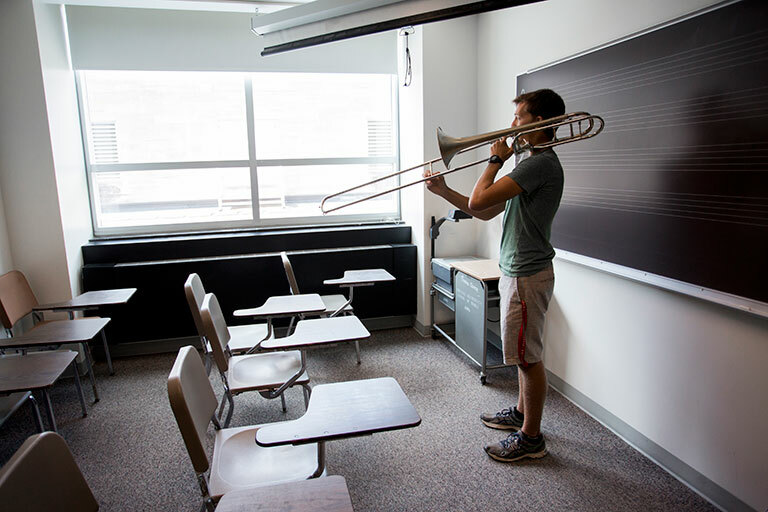 He chose the trombone, setting in motion a love of music and leading him on a path to the Jacobs School of Music to pursue a degree in music education. "As music educators, our goal is to learn to be effective teachers," he said. "I'm not the best player, but I consider myself to be a strong teacher and I have enough playing experience to be able to effectively teach others." Although his major isn't performance, Merback knew he wanted to continue to perform and to be a part of the marching band world that helped shape his high school career. So he was ecstatic when he was accepted to Jacobs -- not only because it is one of the best music schools in the nation, but because it is home to the Marching Hundred. "I would guess for a lot of other people, they are in Marching Hundred because they fell in love with their high school marching band program, and I can certainly say the same for me," he said. "We just had a really strong program with good directors and really good players and marchers. That made me want to continue. So when I got into Jacobs I was thrilled because I knew I would get to be a part of the Marching Hundred." Merback practices before a performance. Photo by IU Communications. Early on, Merback had an eye on becoming the "man down front." His senior year, he took his love for performance and his experience in the color guard and bottled it into an energetic audition for the role of drum major. It worked. He was crowned drum major of the Marching Hundred, a title he is proud to own. "We have enjoyed a long line of outstanding drum majors in the Marching Hundred, and Augie tops that list," said Dave Woodley, professor of music and director of athletics bands at Jacobs. 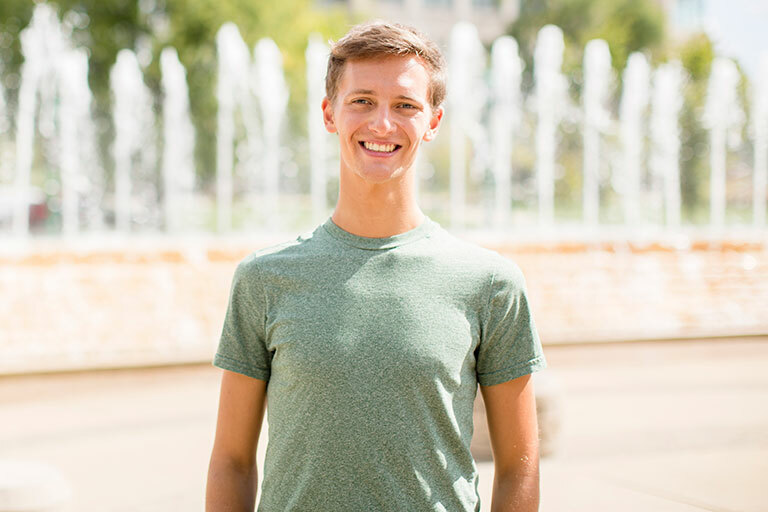 "As a person who has great twirling and leadership skills, Augie has set himself apart with great showmanship on the field and great leadership during rehearsals. He gets along with all band members and is liked and respected by all. We chose Augie based on his entire drum major package: showmanship, leadership, personality and character." Although performing in front of a crowd is great -- his specialty is his spinning work with the mace -- it is the opportunity to lead a group of performers he likes and respects that makes the job so rewarding. "I know it sounds cliché but it’s really the people I like most," he said. "It's that tight-knit feeling with the entire group and the shared love for music and for this band that really makes it a very vibrant, lively and enjoyable thing to do." Like most music majors, music infiltrates itself into most of Merback's world. But he makes a point of trying to step out of his comfort zone. He is a member of the Alpha Zeta Chapter of Kappa Kappa Psi, the band's service fraternity, which like Marching Hundred involves many students who are not music majors. Last year, he spent a semester in Vienna traveling abroad. Merback has been playing the trombone since his junior year in high school, when the school's band director encouraged him to learn an instrument. Photo by IU Communications. When it comes to IU Bloomington, it is the beautiful campus and the diverse people that Merback enjoys most. "I think anyone could move here and find a place to fit in," he said. "I just feel at home here." 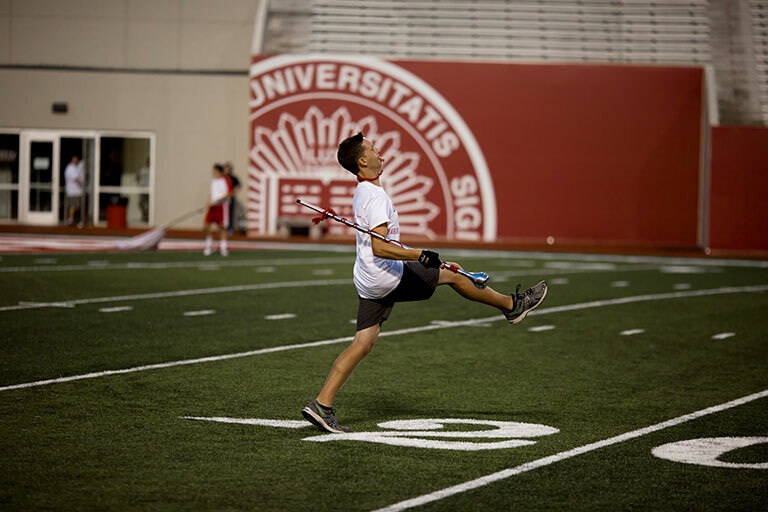 As he enters his fourth year at IU, and his eighth year in marching band, Merback can't deny the impact marching band has had in his life. In fact, following his graduation in May, he hopes to become a high school band teacher. But no matter how many shows he's performed, he still feels a rush every time he puts the uniform on and steps in front of the crowd. "It was thrilling back during my freshman year and it still is today," he said. "At the end of every single show or pregame we do, or even just our march to the stadium, it's almost a guilty pleasure. We get to show off this amazing group and these awesome sounds. It is just absolutely thrilling."